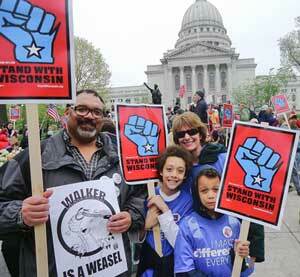 On May 20, the Wisconsin Senate passed one of the most restrictive “Voter ID” laws in the United States. This followed the vote by the Wisconsin Assembly. Gov. Scott Walker said he would sign it quickly. The new law requires a photo ID to vote and increases the state’s residency rule from 10 days to 28 days. This will potentially disenfranchise thousands of seniors, students, immigrants, and poor and disabled people, according to the Wisconsin AFL-CIO. Members of Latino/a and African-American communities would be severely affected by this law, including youth. The progressive coalition Wisconsin Resists is planning protests opposing the bill and its signing to be held at the state Capitol on May 25. Protests also continue across the state to oppose the right-wing frenzy of draconian legislation being proposed, passed and/or signed by Walker. These new laws and proposed laws include attacks against the Earned Income Tax Credit by attempting to raise taxes on beneficiaries, more tax increases on poor people, initiatives aimed at expanding charter schools state-wide, as well as the ongoing efforts at union-busting. Additionally, progressive forces are opposing other attacks on the poor and working people of Wisconsin, including billions in cutbacks to vital social programs in Walker’s 2011-13 state budget proposals. 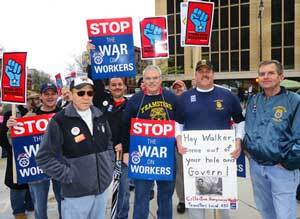 The Wisconsin Supreme Court will hear arguments on June 6 on the union-busting bill signed by Walker on March 11, which would virtually eliminate collective bargaining rights for up to 200,000 public-sector workers. There are efforts underway to pack the court and protest on that day as well. The Wisconsin AFL-CIO and other labor-community-student groups continue to engage in recall campaigns against politicians who voted for the union-busting bill in March.